Maeve O’Neill, a cyber-security analyst, is shocked to wake up in a strange bed after a rare night out. She is horrified to discover twin punctures on her neck and claw marks on her hip, because such a combination is not just impossible – it is forbidden. 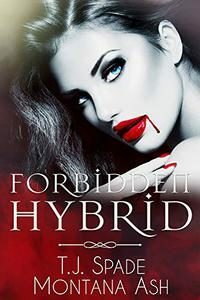 When she realises she is not alone, but surrounded by three first-responders; Bishop, a surly werewolf homicide detective; Gabriel, a gorgeous human paramedic; and Lucian, a charismatic vampire fireman, Maeve isn’t sure if she has been kidnapped or is living out her wildest fantasies. Unfortunately, the reality of becoming the first hybrid in existence is fraught with danger, and Maeve must work with the three best friends in order to track down the serial killers who changed her life forever. As the four work side by side to expose a dark conspiracy, the immediate attraction between Maeve and her three saviours becomes a staggering connection. Long-denied desires surface and new foundations are laid, as an unshakeable bond forms, forging the four together for eternity.